Night Buddies and the Pineapple Cheesecake Scare by Sands Hetherington. A Night Buddies Adventure. 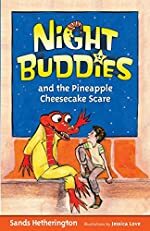 Review: Night buddies and the Pineapple Cheesecake Scare by Sands Hetherington. A wonderful story about two buddies out on a midnight adventure to find out who has been eating all of the pineapple cheesecakes, a dessert which both of them can't resist. It starts out when a boy named John Degraffenreidt has eaten too many pineapple cheesecakes but doesn't want to go to sleep. After being almost forced into bed, his Night Buddy, Crosley the red crocodile, crawls out from under the bed and states the situation: All of the pineapple cheesecakes from the factory has disappeared. They then settle that they should solve this mystery or they would be never able to taste the pineapple cheesecakes again. After sneaking past John's parents due to the "I ain't here" doodad on Crosley's belt (which is filled with crazy tools) they then find a train and work their way to adventure. What I like about this is the humor, the crazy story, and the characters. The humor is very funny. You have red crocodiles, gangster like iguanas, food aromas that are so gross that it could make you faint. The story is even funnier though. It starts with John eating about 10 cheesecakes to him seeing CAVES of cheesecakes! Then you have things like red crocodiles needing pills due to water allergies and iguanas hating the smell of pineapple cheesecakes. So overall, I think these three things fit in with each other perfectly like a puzzle to form a very funny story. We would like to thank Dune Buggy Press for providing a copy of Night Buddies and the Pineapple Cheesecake Scare for this review. Have you read Night Buddies and the Pineapple Cheesecake Scare? How would you rate it?